Some have referred to it as "nuking the fridge". Perhaps even "razing the hospital" may make it into the televised vernacular of the future. However, no matter how you rewrite the series, its downfall will always be gauged as the point where the series has "jumped the shark". Its origin comes from that agonizingly-long time in a particular episode of Happy Days for the Fonz approach a ramp to jump over a shark with a relatively-slow set of water skis and a perfectly unblemished leather jacket. Aerodynamics and primal instincts be damned—the Fonz jumped the shark. Meet Rio's breast best friend Rina. I bring this up during an anime review to emphasize a particular flaw in the "Jumping the Shark" theory—sometimes the show is so ridiculously inept in its plausibility from Square One that "jumping the shark" actually helps the show stay memorable, despite all of its other flaws. Case in point: so far in Rio: Rainbow Gate!, we've seen our share of cases where our main character Rio has won her matches out of sheer luck. A metaphorical journey through a house of cards results in Rio winning poker with a pair of twos. A hallucinogenic volleyball game breaks out during a "bowling roulette" challenge, in which the opponent loses thanks to a band-aid coming loose. A game of craps is won when a ghost's possession is thwarted by spicy habanero chicken wings. 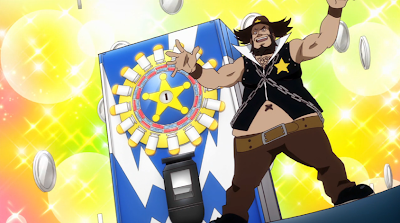 "Me wa horrible stereotype desu!" Despite all of these ridiculous games and unrealistic finishes, the series now decides to unfold with plot, as Rio is reunited with her long-lost "sister" Rina, who has been hired to become a dealer at Howard Resort. While Rio is excited, there's definitely something uneasy about Rina, as she is not only ruthless in her competitive spirit and deflating when it comes to customer luck, but she seems to have her eye on the "Gates" Rio has collected so far. To test the limits of the show's over-the-top stretch towards implausibilities, the casino's owner Tom Howard goes beyond the beyond, introducing the island's tourists to the first flying casino. It is here that Rio is forced to fight against two more Gate Holders; one in a lengthy water-slide race against the ship's chipper female android Linda, and another in a too-realistic game of "Space Pinball" versus a telekinetic kid promised freedom from his boss in he were to win. Both games pit Rio's team against the conniving Cartia, a vamp who plans to take Howard Resort by force. Seriously. She should be dead by now. Rio: Rainbow Gate! is obviously in it to tantalize the viewer with cheesecake and costume changes that get Rio into skimpier and skimpier situations. Logically speaking, there really should be no reason at all to follow the show. The plot is limping to the finish line as characters from the pachislo games crash the party with hardly a reason—we get an overweight cowboy who speaks in "You wa SHOCK!" Japanese and an Afro samurai with a severe losing streak, but neither factor into the major battles. So why have them there in the first place? Like Fonzie's jump, there's just nothing that makes sense. Why is the ship's android not getting electrocuted by a water-slide race? How in blazes does the "wind from the excited customers" affect the trajectory of clay pigeons in a shooting contest? How can holograms be so realistic that a meteorite could smash the glass of a viewing room and drag Rio's stalker friend Mint towards a black hole? It's like monkeys are hammering this show's script out with typewriters. And as far as the "jumping the shark" analogy goes, Rio has taken that approach a step further. 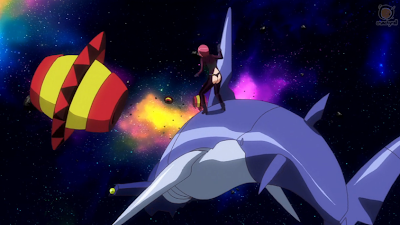 By Episode 6, "Roll Ruler", she's actually jumping onto holographic space sharks. Seriously. I'm half-expecting a dinosaur to be reconstructed and the crew to travel back in time, all for the sake of a Gate Battle and a costume change that shows more of Rio's mother-of-pearl breasts. I'd like to see Henry Winkler do THIS in a leather jacket! It's this unfortunate mockery of all reality that makes the show so much more of a car crash to watch. There's nothing exceptional about the characters. The acting is shoddy. The art is forgettable. The only thing keeping the show from oblivion is the anticipation that the next episode couldn't be any worse than the next one. In fact, the show is so bad that it continues to be good due to its badness. The formula cannot be changed from here on out. It's best the show continues to jump sharks; if Rio: Rainbow Gate! ever gets serious and gets dramatic, it's all downhill from there.